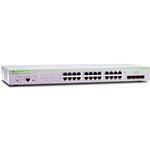 The Allied Telesis CentreCOM AT-GS924M offers 20 x 10/100/1000T + 4 x Combo Ports. This switch provides an intelligent, energy efficient, and cost-effective solution for the edge of the network. The CentreCOM GS900M Series is designed to reduce power consumption and to minimize hazardous waste. Fans are designed to minimize noise pollution. High efficiency power supplies, low power chipsets, and effective power management deliver both a reduced carbon footprint and cost savings for the end user.